Exploring Places and Maximising my Trip with TripAdvisor - Holy Smithereens! I’m pretty sure that most of us here ‘grew up’ travelling with TripAdvisor. Before blogs, Instagram and other online review platforms came about, TripAdvisor has always been my go-to site for travel preparation. First, it was to check out the hotels I’m about to stay at and see the hotel rankings in a destination. I enjoyed reading all the reviews that people from all backgrounds and all walks of life gave. And TripAdvisor had always been handy when I wanted to check out the top activities and tours to do in a city. I especially love the straightforward , no-nonsense format of the site, while making it easy to search, filter and navigate. I also like how, after all these years (TripAdvisor was founded in 2000, 17 years ago! ), the website format and design has changed very little. I love the familiar owl logo and the green theme. The only change is that the site grew more seamless and faster over the years. I was very thrilled to find out that not only can you read unbiased reviews on TripAdvisor, you also can now directly book hotels and tours with them. A couple of weeks ago, I found myself wanting to escape the busyness of Manila. The Philippines’ capital is never boring , but sometimes a quick escape from the noise is what one needs. 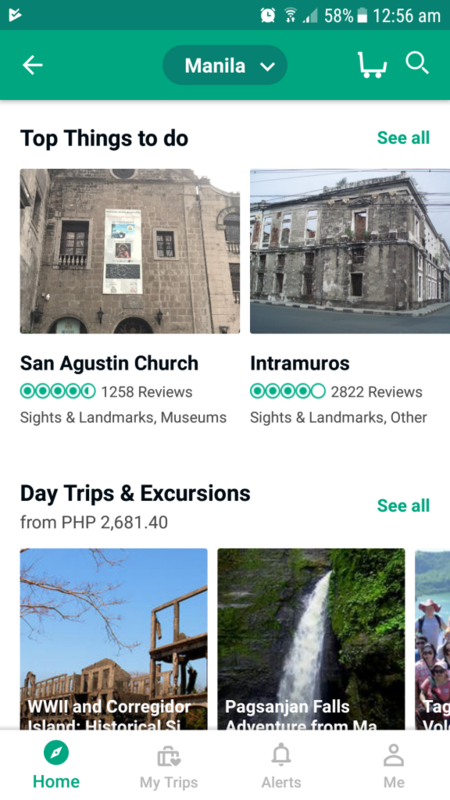 I had a voucher from TripAdvisor to use, so I used the mobile app to search for quick day trips from Manila. Using the mobile app was just as straightforward and easy as the actual website. The app is also able to filter out trip costs from lowest onwards. The trip that I chose was Tagaytay Ridge Tour, a day trip from Manila that goes to Tagaytay, a hilly (and chilly) city 2 hours away from Manila, that also goes on a sightseeing tour around Taal lake and volcano, with a stop at a jeepney factory, and a church that houses a bamboo organ that is more than a century old. Booking the tour was extremely easy. TripAdvisor not only delivers reviews of the tour, it also showed me availability of the tour on the dates I chose, and also the price of the tour per person, which varied depending on the date and number of people. As soon as I booked the tour, I got an email confirmation from TripAdvisor right away, and less than 12 hours later, a confirmed voucher from the tour operator. On the day of the tour, I was picked up by the tour operator at my hotel lobby. Considering the Manila traffic, the pick up was right on time and soon we were off to Tagaytay. As there were only 3 guests who booked, it almost felt like a private tour. I’m glad that this trip had a confirmed departure, meaning they did not have a minimum required number of booking for the tour to confirm departure. Our tour guide, Omar, gave a brief rundown of what can be seen around Tagaytay, and the history of Taal Lake and Taal Volcano. 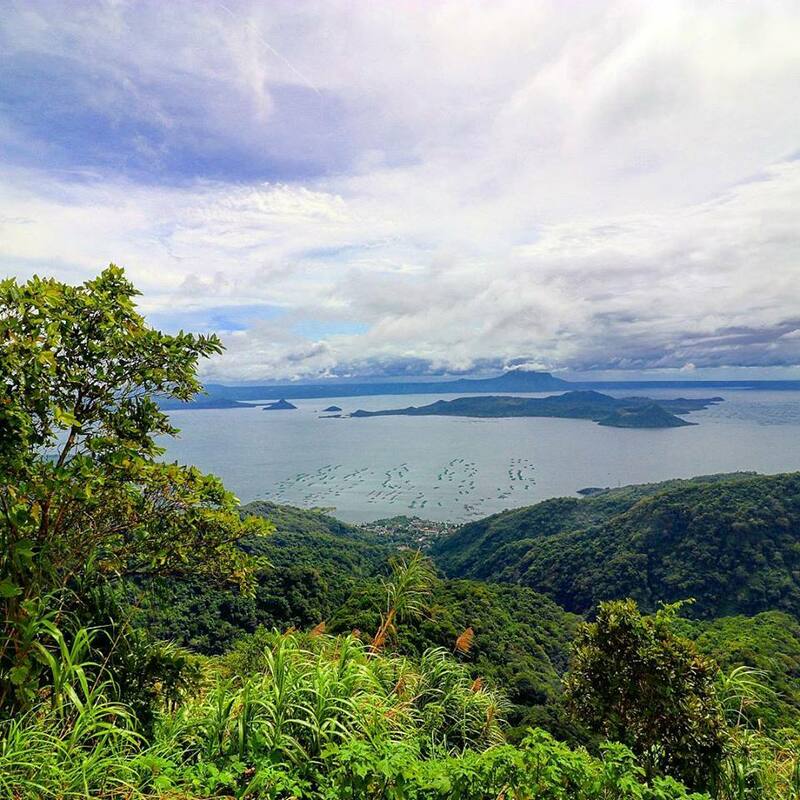 Tagaytay is a hilly city that sits on a ridge above Taal Volcano Island. As we made the ascent to Tagaytay, I saw the environment slowly change from a crowded megalopolis that is Manila, to a quieter, more serene atmosphere. More importantly, the weather became vastly different. 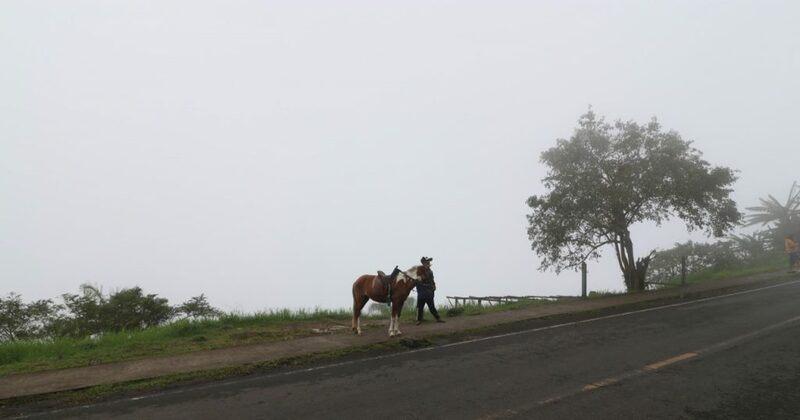 It was at least 10 degrees cooler in Tagaytay, and the morning of the tour was particularly foggy. I was worried that the fog might stick around for the rest of the day but closer to noon, as we made the drive to Taal Lake, the sun came out just enough for me to witness what is one of the most beautiful lookouts I’ve seen in the Philippines. Taal Lake is a freshwater lake that fills Taal Caldera, a volcanic caldera formed by large eruptions thought to have occured around 300,000 years ago. This kind of view and serenity is quite hard to find within less than 2 hours away from Manila so I was really grateful that the fog momentarily disappeared and I was able to get some quick snaps before rain fell. 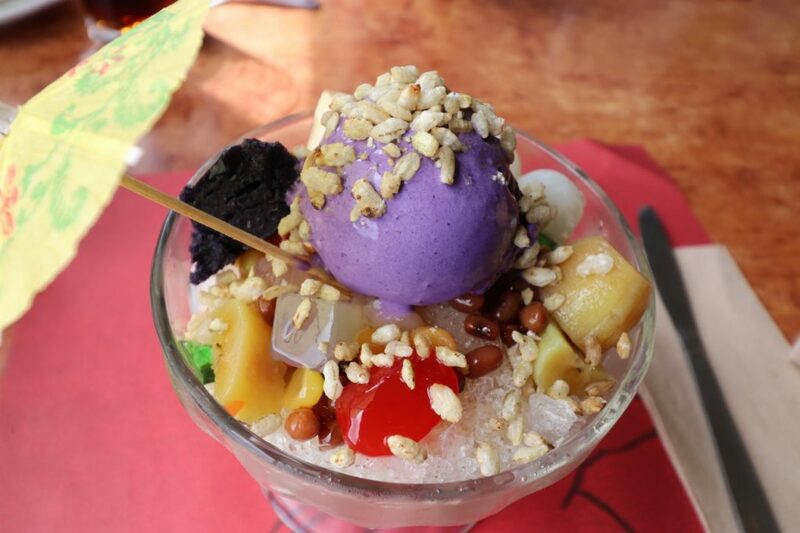 Halo-Halo (loosely translated to “mix-mix”), is probably the most popular trademark Filipino dessert. Ingredients can vary widely, but they usually include shaved ice, evaporated milk, toasted rice, sugared plantain (bananas), sugar palm fruit, and a hefty scoop of Ube (purple yam) ice cream. My favourite part of this lively and colourful concoction is the Ube ice cream. Ube has probably been the ‘ingredient of the year’, marking its popularity in specialty bakeshops that make Ube cupcakes and desserts around the USA and other parts of the world. Ube has always been a staple in Filipino food and you are bound to get the best ube (and halo-halo) experience in the Philippines. We made a quick stop to see a Jeepney factory. Jeepneys are the most popular means of public transportation in the Philippines. Jeepneys were originally made from US Military Jeeps that were leftover from World War II. 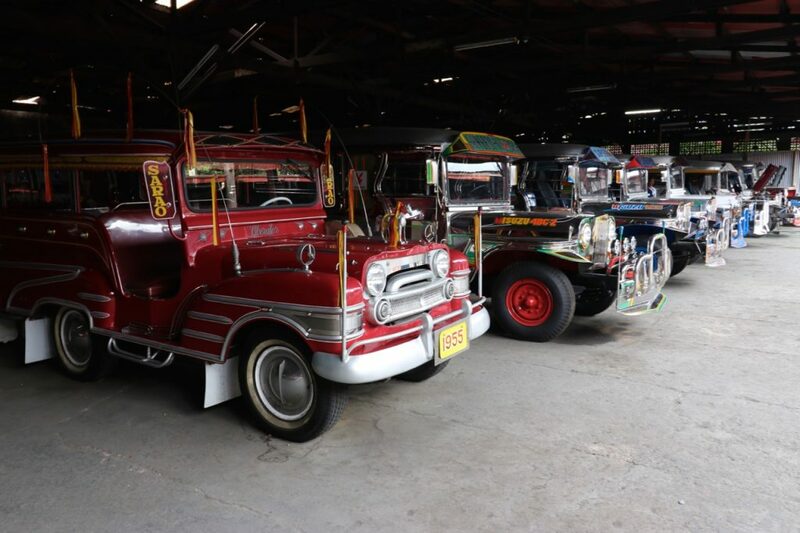 Jeepneys ( this word is a combination of Jeep + ‘Jitney’, a term used for an American cab back in the 40’s) are known for their crowded seating and very kitsch and personalised decorations. Our final stop was the Parish of St. Joseph, where a Bamboo Organ that is more than a century old still stands intact, and plays perfectly. We were given a tour of how the organ was constructed in 1816, when all parts of the organ were made from bamboo. There have been a number of restorations given to the organ, but majority of its parts are still original. The staff also regaled us with at least 2 musical pieces that they played live using the organ. It was still very much in tune for a musical instrument that was finished in 1824! The Philippines is the 4th largest Roman Catholic country, with more than 80% of the population practising Catholicism. 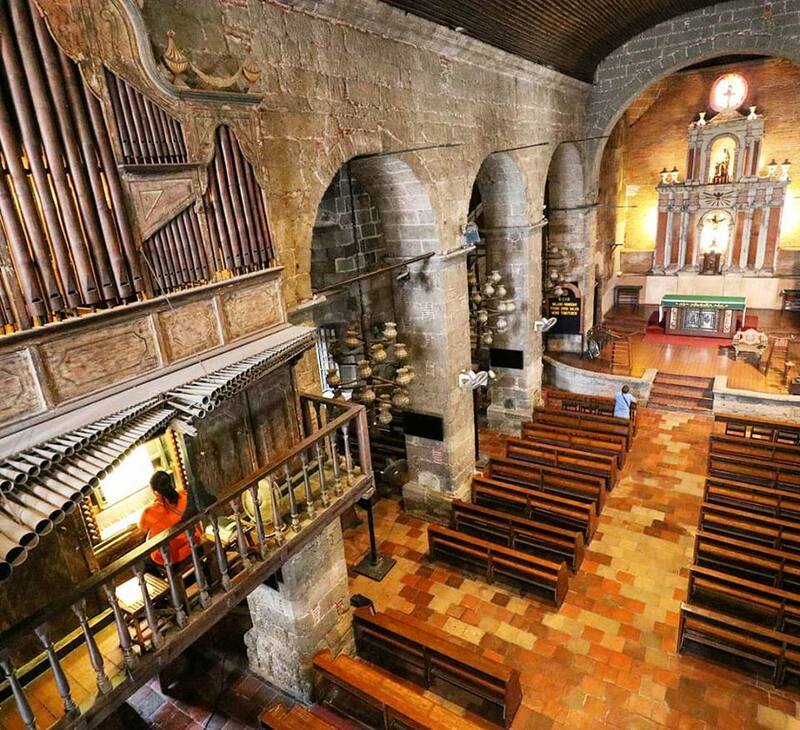 The Philippines was under Spanish rule for close to 400 years and one can say that this bamboo organ was one of the ‘lasting legacies’ of Spain in the Philippines, as it was built by Fr. Diego Cera, a Catholic priest sent to the Philippines under the Augustinian Recollects. We were back in Manila about 4PM, and it truly was a great and much needed break for me to have seen and learned a lot of geographical and historical sights in one day. How was booking with TripAdvisor any different? I was able to save a lot of time using TripAdvisor as a booking tool. Whereas previously, I looked at TripAdvisor for reviews, and then created an entire new search or window to look for the best price for my chosen attraction or hotel. Maximising my trip with TripAdvisor also meant that I have peace of mind booking the lowest price of my chosen tour. TripAdvisor has a low price guarantee whereby if you are able to find a lower price within 72 hours of booking, or if you arrive at your destination and find your hotel/ activity / tour offered at a lower price by the operator, TripAdvisor will refund the difference. Time is something extremely essential when making travel plans, and skipping 1-2 steps in my usual travel booking via TripAdvisor ensures that I spend more time enjoying, than worrying about my trip. This post was created in partnership with TripAdvisor. I was given a voucher to complete a trip of my choice, but all thoughts and opinions are mine.